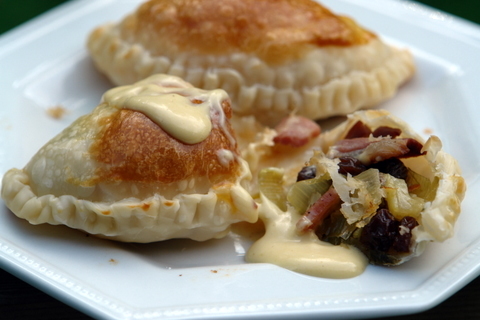 Another empanada recipe inspired by local and seasonal produce: leeks from the farmer’s market. Occasionally I actually go to the farmer’s market with a cooking plan in mind, but most of the time I just let myself get inspired by what I find there, which in the past weeks has included large amounts of leeks and asparagus. I made leek empanadas twice in the last couple of weeks, for my first version I used bacon, hard-boiled eggs, olives and Swiss cheese, everyone loved them but I thought the eggs didn’t add much and the saltiness of the olives didn’t go to well with the bacon, I also felt the empanadas need a little bit of sweetness so the next time I replaced the eggs and olives with raisins and I also used pancetta instead of bacon. 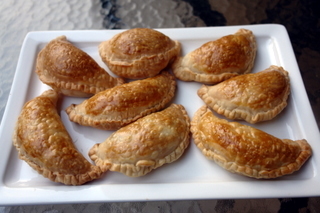 The second version was much better, though I preferred the softer taste and the greasiness of the bacon to the pancetta; empanada fillings are very customizable and can be adapted based on what you like, as well as the ingredients you have in stock. 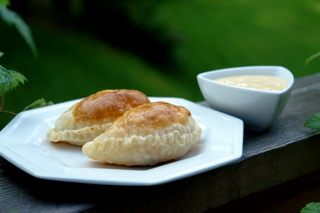 I like having a dipping sauce for empanadas, sometimes it is easy to foresee in advance what kind of sauce would go well with a particular empanada, but sometimes you just have to wait until you have a bite of the empanada, when I tried these I thought that some kind of spicy but sweet sauce would be perfect, I made a quick sauce by mixing spicy mustard with a little bit of honey and mayonnaise. Sautee the bacon or pancetta until it is crispy and golden, drain to remove any excess grease but reserve a couple tablespoons of the grease to cook the leeks. Fry the leeks in the grease reserved from the bacon or pancetta and let them cook until they are tender, about 10 minutes on medium heat, stirring occasionally. Once the pancetta and leeks have cooled down combine them in a bowl with the grated cheese, raisins, nutmeg, salt if needed, and pepper. 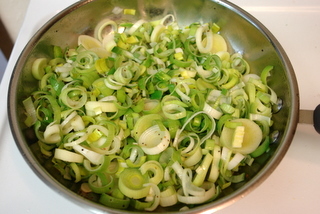 To assemble the empanadas spoon the leek mixture on to the center of the each empanada disc. Brush the edges of the empanada discs with the egg whites, you can also use water but the egg white is a good natural “glue” that helps seal the empanada. Fold the empanada disc and seal the edges gently with your fingers, twist and fold the edges of the empanadas with your fingers, as a final step use a fork to press down and finish sealing the empanadas. Lightly brush the top of the empanadas with the egg yolk; this will give them a nice golden glow when they bake. Let the empanadas rest in the refrigerator for at least 30 minutes or until ready to bake, this will help them seal better and prevent leaks. Pre-heat the oven to 400 F and bake for 20-25 minutes or until golden, exact time will depend on the size of the empanadas and your oven. These look absolutely delicious! Would love to try making these this weekend! Is the dough recipe the same as the one for the empanadas de viento (fried version?) I’d love to try making these baked!! My husband and I made these last weekend. They were delicious. I agree with the one of the other comments above that the dough was delicious. Love your site. These were absolutely amazing. I love your site. 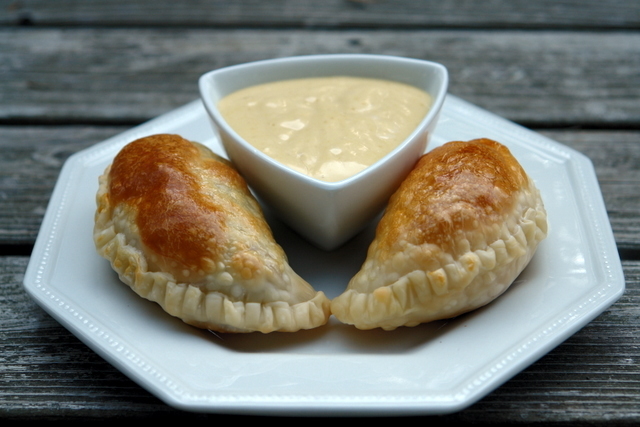 Such good flavor, and your empanada dough recipe is really good as well! Please, can you include another photo of how you make the edges look so clean and neat? Twist and fold, hmmm? I’ve worked with pastry dough quite frequently and the only thing I can manage is sealing the edges with a fork? How do you twist and fold an edge of an empanada? I would love to see a series of photos showing the method. Thanks in advance if you can do this for me. Love the dough receipe – it is sooo very easy (even without a processor). Put my own special filling in the first time I made empanadas and will now try the leek receipe as it sounds great! Thanks for this. Estas empanadas me salieron perfectas! Muy ricas, muchas gracias!!! Tried these last night along with the Mendocinas. Remarkable! Both are very delicious. Some of the best I’ve ever made… And I will never use store bought discs again! Your dough recipe is so simple and very yummy. Cheers! This ARE amazing. Never seen these before. Yum, yum, yum! These sound like some amazing empanadas! Yum! These came out so perfectly. They’re gorgeous! You can find the disks in the frozen section of Latin grocery markets – the Latino Market at Pike Place has them -, there are two types of discs for baking that they usually have in stock, one is the “crispy” kind, which is a lighter type of puff pastry and the other is a “flaky” type, which is a lot like a puff pastry. Where do you get empanada disks? Is it just basically puff pastry?